As I thought my grown-up thoughts the little girl in the row behind me singing along joyfully and tunelessly to every song and confidently repeating bits of the narrative reminded me that everything would be alright tomorrow. It might well be the Hard Knock Life, with its many orphans and multiple economic depressions, great and small, but this sumptuous show, produced by Pieter Toerien and Hazel Feldman, will cheer the saddest of sacks. Don’t worry if you don’t have a real living, breathing child to take along. Put your hair up in pigtails and let your inner child out for a bit. The production is fabulous, the lavish set and wonderful costumes whisking us to 1930s New York. Even if it is set during the Great Depression, here even the saddest people sing in tune and dance in step. Perhaps that should be a lesson to us all? Once the initial scene-setting in the orphanage is over one hardly notices any sadness with the focus on the delightful and gutsy 11-year-old redheaded orphan girl, Annie, who is determined to escape her life of misery at Miss Hannigan’s orphanage and find her real parents. Our Annie on the night, Lilla Fleischmann, lived up to expectations, with a confident and compelling performance. She even pulled off an American accent without a hitch. 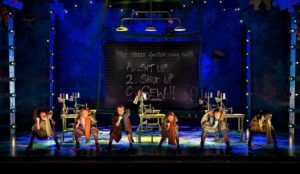 Expectations had been quite high since the producers had proudly noted that “following an extensive six-month nationwide search we have found the three best Annies in the country: Emma-Rose Blacher, Lilla Fleischmann and Caitlin Dicker”. The rest of the girls in the show gave confident performances, their singing voices seeming to defy their slight stature, right down to the smallest, who probably should have been in bed. But that’s a silly grown up idea. This show clearly delighted the many children in the audience and I could swear I heard a few childish shrieks from grown-ups around me. There were some adult laughs, too, thanks to quite grown-up themes – greed, manipulation, pure evil, that sort of thing, all very subtly handled. Of the grown-ups the standout performance for me was from Stephen Jubber as Rooster, who holds nothing back without ever seeming over-the-top in a role that could easily be so. 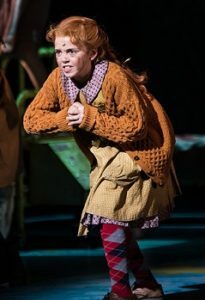 Charon Williams-Ros is a fun and convincing Miss Hannigan, and Neels Clasen as Daddy Warbucks made us wish we had better billionaires in our world. 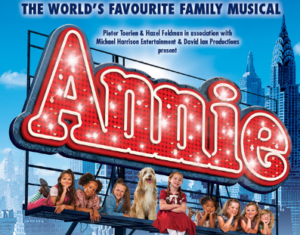 Annie is a treat for adults and children and an excellent reminder that the sun will come out tomorrow. Leapin’ Lizards! You can bet your bottom dollar that you’ll love it!